Welcome to week two! My prayer is that God blessed your family time in His Word seeking the truth about love last week. So now we come to the second fruit of the Spirit: Joy. The crux of this week will be teaching your children the difference between happiness and the abundant joy that Jesus offers us through The Holy Spirit. When things don’t go our way and we quickly resort to whining or complaining, then we aren’t fully grasping the joy available to us from the Holy Spirit. Kids struggle with this. Adults do too, for that matter! They want something now and if it isn’t given, they show you. How can we as parents guide our children into finding a deep abiding joy that is not changed by circumstances? It isn’t an overnight fix, but scripture is clear about how to address this heart condition. I will admit my youngest really struggles with this one. For several months now, we have been teaching her about how whining and complaining is sinful behavior and that it shows selfishness and a lack of thankfulness in our hearts. We have been consistent in discipline, but it is really taking time. 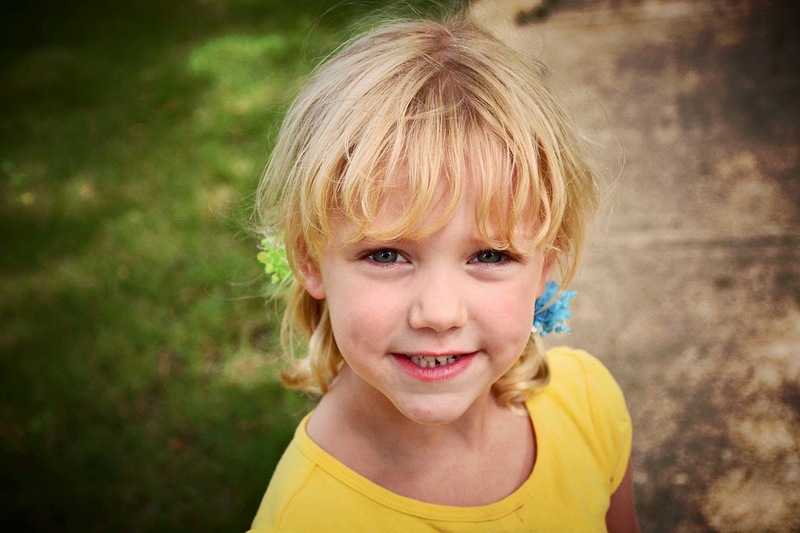 This week, however, she made a profession of faith in Christ and decided to follow Him! She now has an opportunity not just to hear the truth about joy, but experience it! In fact, after she accepted Christ she could not contain her joy–the joy of her salvation! It is going to be really important that you read through each day’s lesson before going through it with your kids. This week, I tried to include verses that would speak to both younger and older kids. If you only have younger kids, read through them and discern which are best for their age and understanding. There are several verses this week that will be great discussion points for your pre-teens and teenagers. Make sure you prepare all the things needed for the activities before you begin them. It won’t take much work–I promise! Make a sign with the word “chara” on one side and “charis” on the other side. You are going to show the similarity between Joy and Grace. Pick out an item that your kids REALLY love/want but belongs to you. You are going to hide it and they will have to find it. Print out a copy of the Psalm 119 matching worksheet for each child. You can get the worksheet here. It is included in the printout sheets for this week’s study. Write a letter to each child. You can divide and conquer–i.e. mom can write to one child and dad to another, etc. Tell your child why he/she brings you joy, giving praise to God as you write. Always acknowledge God’s involvement in the joy your child brings. 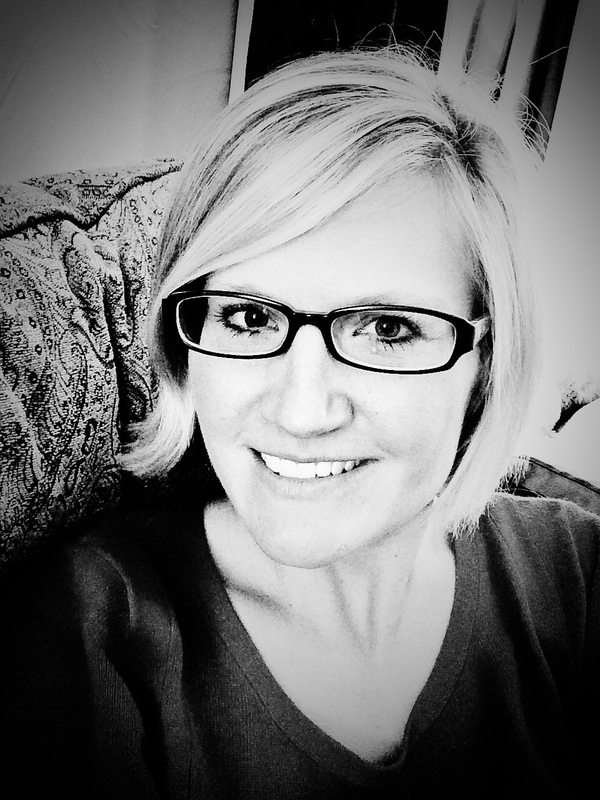 DAY FIVE: How Can God Use Me? Have several blank sheets of paper for your kids to either draw or write on and provide pens/crayons/markers. You will need several objects from around your house that are gold, silver, or glass. You must be able to see your reflection in one of the objects. You can use a small mirror! You will need all the fixins’ for lemonade. See link to recipe just below this sentence. (You can do this activity on a different day or do both activities on the same day). FRUIT FOR THE WEEK: Either bananas or lemons. We are going to use lemons. I want to emphasize joy in the midst of our sour experiences in life. We are going to make lemonade, lemon bars, lemon poppyseed bread, etc. Shape for the week: Circle (joy is eternal and unending. My oldest actually came up with that! Lasting joy and satisfaction can not come from the things the world gives. God is our only true, lasting source of joy. When you experience happiness because of a yummy meal or a new car, etc. you can keep your heart focused on God by acknowledging Him and giving Him thanks. A thankful heart is a joyful heart. While we were sinners, Jesus took our punishment. We deserve separation from God, but God showed us favor we didn’t deserve because He loves us. That is the greatest reason for joy. The Bible is THE best written source for help when we need it, for comfort, for understanding God, for changing our lives, for giving us joy. It is God’s gift to us. We need to build solid friendships with other believers in Christ. Our brothers and sisters in Christ are very important to us. Their fellowship, help, encouragement, and shared experience will give even more joy on our journey with Christ. God has a purpose for you. Obey Him and watch what joy will come when He uses you for His Kingdom purpose. Christians suffer. The path we travel is not easy. But, as followers of Christ, we can have joy and hope in the midst of grief and suffering. Jesus suffered more than any of us will ever suffer. He knows our suffering. But he endured it for the joy of bringing us from death to life and having us with Him in heaven for eternity. Explain to your kids that the New Testament wasn’t originally written in English, but in a different language called Greek. (If you have older kids that already know this, ask them if they know the original language). The Greek word most commonly used for “joy” is “chara” (kahrah–with emphasis on the last syllable). Say “chara” together as a family. Have your kids create a hand motion or sign language that they think would represent joy. Do it together as a family and say the word “chara“. Use this motion everyday as you talk about joy. Who is the source of our joy? Where does joy come from? You are going to make two pathways in your home. One set of colored footprints will lead to a sign that reads “TEMPORARY HAPPINESS“. 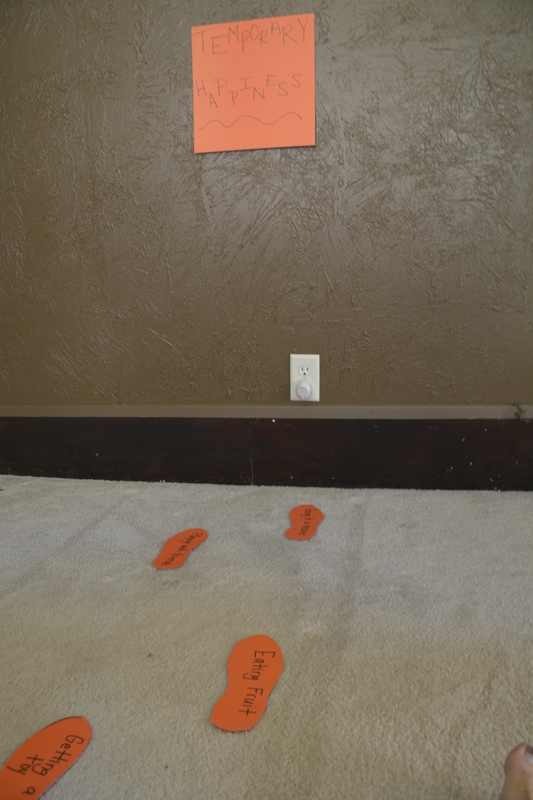 This path will lead to a dead end so put the sign on a wall and have your footprint papers lead right up to the wall. 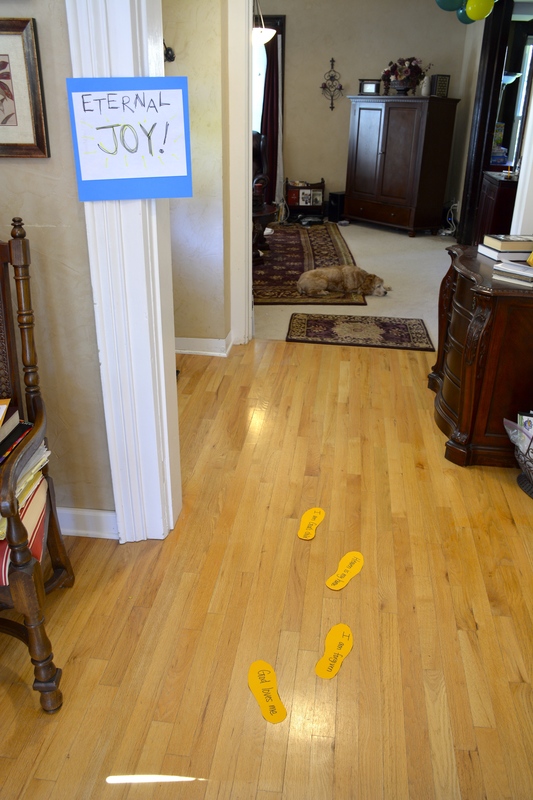 The other set of colored footprints will lead to a different sign that reads “FOREVER JOY“. This path will make a circle or oval in your home–where there is no end. Hang the sign on a doorpost that you can walk through. This will allow your kids to experience what unending and everlasting means! At first, you will think of them as two different trails. On the first set of colored papers write down circumstances that make your kids feel happy. If you want, you can ask your kids the question : “What makes you feel happy?” and write down what they say. Older kids can write it themselves. These are just ideas, you can write whatever fits your kids’ ages the best: “Getting a new toy”, “Eating your favorite foods”, “Buying something with your saved money”, “Going to a friends house”, “Getting a good grade at school”, “Being liked by my friends”, “Watching TV”, “Playing a video game”, “Buying/getting a new outfit of clothes”. On the second set of colored papers write down these truths and their corresponding scriptures: “God loves me” (John 3:16), “God has a purpose for me” (Eph. 2:10), “God knows me personally (Psalm 139)” “Jesus took the punishment I deserve” (Is. 53:6) . If you have children who have accepted Christ include these: “God speaks well of me” (Eph 1:3) OR “I am blessed by God” (Eph 1:3), “I belong to a forever family”, “I can spend forever with God in heaven” (2 Peter 1:11), “I have an everlasting inheritance”(1 Peter 1:3-4), “I am forgiven” (1 John 2:12). Go down the “TEMPORARY HAPPINESS” path first. Talk about how with each of these, they maybe happy for awhile, but the happiness doesn’t stay. One thing we have pointed out before is how our girls wanted a certain toy so badly and when they finally got it they were happy, but a few months later they didn’t even play with the toy anymore. Instead, they wanted something new. You could also make the point that even if a friend is nice to you one day, they may not treat you well the next day and how happiness is affected by that. Next, go down the “FOREVER JOY” path. As you come to a paper read the verse that corresponds and expound on it a bit. For instance, when you come to the paper that reads, “God speaks well of me” you can read the scripture and then talk about how God always speaks blessings over us. Our friends may say a mean thing about us, but as believers, God never will. ****Finally*****, and this is the cool part, take some of footprints from the TEMPORARY HAPPINESS path and intersperse them with the footprints on the FOREVER JOY path. They are now a part of the eternal path. 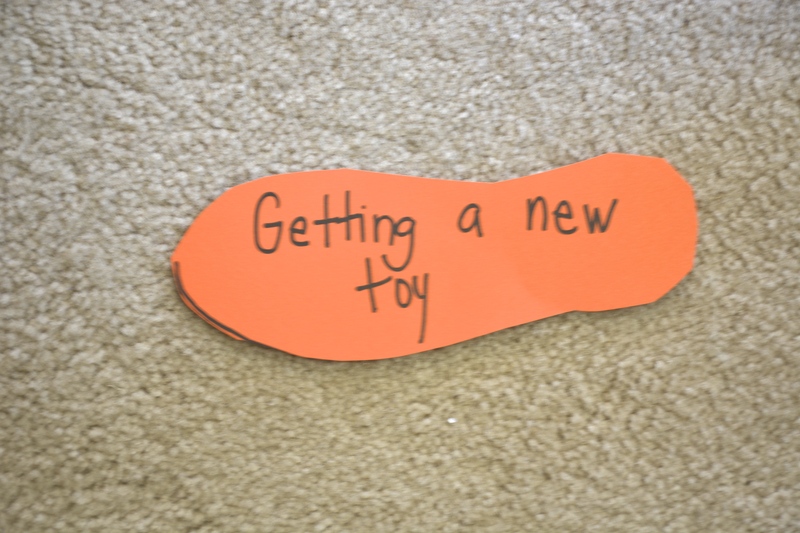 When you step on the footprint, “Getting a new toy” you can teach your child that even though it is temporary, you can still have a forever perspective about it. Say, “When you get a new toy, you can thank God for giving it to you.” Or, when you step on the footprint, “Eating my favorite food”, you can say, “God is the giver of all good things–even the food we eat. Next time you eat your favorite food, thank God for the food he gives to us.” Do this with as many of the footprints as you can. I think you will notice that JOY and THANKFULNESS are linked! It is THANKFULNESS that brings the temporary into the eternal! Take time to answer any questions that might arise from this activity. DAY TWO: “Where does real joy come from? Ask your kids what they learned about joy yesterday. Emphasize that when we are thankful to God our hearts are ready for joy to take over! Use your sign language created yesterday and review the Greek word “chara“. You are going to show your kids a really cool thing about this word today! Question for today: Why does our Joy come from God? What has He done for us that gives us joy? What did the angel say that Jesus would save his people from? Non-believers are referred to as not having their names in what book? Why were the 72 joyful? Jesus corrected them. What did he say should be the reason for their joy? Romans 5:8 says that while we were sinners Christ died for us. We all deserve the punishment described in Revelation 20:11-15 because “All have sinned and fallen short of God’s glory” (Romans 3:23) and the punishment for sin is death (Romans 6:23). This is why the angels said Jesus’ coming to earth was a reason for joy! Without him coming and dying and raising from the dead, we would all be in our sins and destined for death and separation from God forever! God’s plan for Jesus to die and take the punishment instead of us is how he shows us GRACE! Grace means that God showed us favor and punished His own Son instead. When you believe in Jesus’ work on the cross, and believe that He rose again, you are accepting God’s GRACE plan. Ask your kids: What is similar about these two words? This is where our joy comes from! God’s act of GRACE gives us the reason for JOY! Earlier in the day, hide a special family treasure somewhere in your house. Or you can hide something that your kids have really been wanting that belongs to you but you haven’t let them touch it or have it. (I’m hiding our ipad). Tell your kids that you have that special item hidden in the house and they must find it. Give your kids clues about where it is hidden. For those of us who desire to follow Jesus, we have the same joy as the people described in these parables! 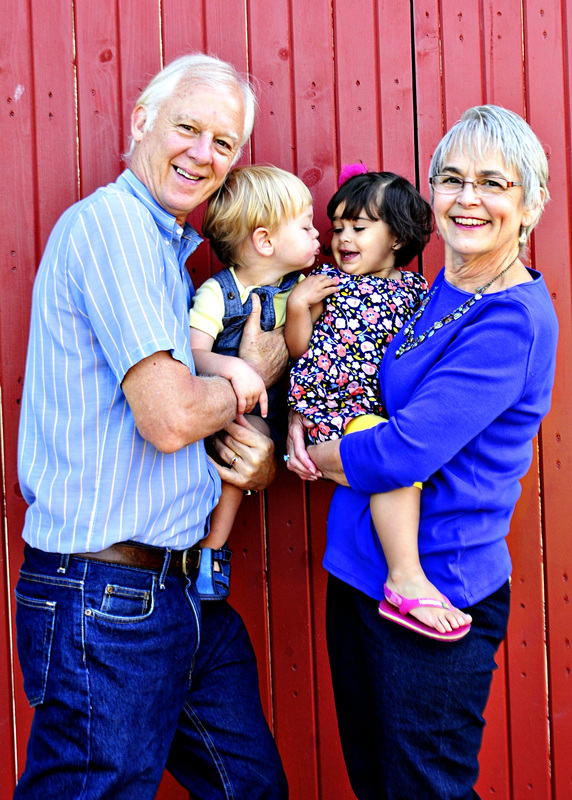 TALK TO YOUR KIDS ABOUT THE JOY OF YOUR SALVATION–GIVE TESTIMONY! Finish by reading Isaiah 51:11 and then turn it into a prayer that you pray over your family. 1 Peter 1:8: Even though we don’t see God, we know Him and have great joy! Also give each child who can read the matching Worksheet On this worksheet they will match the meaning of each verse with the scripture reference. Say to them: “Remember how we found the treasure of salvation yesterday? Well God has given us another very special treasure. His Word. Did you know that God uses His Word to bring us joy? Psalm 119:14 God’s Word and commands can bring us more joy than riches, money, or things. Though toys get broken and clothes get worn out, and money comes and goes, you can have joy from God’s commands and words EVERY DAY! Psalm 119:16 God’s Word can bring us such joy that we want to read it everyday. We can delight in what the Bible teaches us. Psalm 119:24 We can look to God’s Word for answers when we have questions. God uses the Bible to teach us. Psalm 119:47 We delight in God’s Word because we love His commands and teachings. Psalm 119:111 God’s Word has truths that can be the joy of our hearts. Psalm 119:143 When hard and painful times come, the Bible can bring us joy and delight. FINISH TODAY BY GOING AROUND THE CIRCLE AND HAVE EACH PERSON SHARE THEIR FAVORITE SCRIPTURE VERSE AND WHY IT BRINGS THEM JOY. BEFORE YOU MEET TODAY, write a joy letter to your each of your children. Following the example of Philippians chapter 1, write how God has blessed you through them, and what you enjoy about your kids. Include some of the things you pray for each child–just as Paul does in this chapter. START THE LESSON BY READING THE JOY LETTERS YOU WROTE TO YOUR KIDS. Have a child read Philippians 1: 1-8. Read the passage a second time with a different child or parent. Ask your kids: What clues do we see that show us Paul loved the Christians in Philippi? They have a SHARED experience. Did you know that all Christians share and experience many of the same things? You are not alone. Paul knew that God would finish the work He began in their hearts when they became Christians. Christians can GROW together. Paul really missed his Christian friends while he was in prison. He longed to see them and have fellowship with them. Because we SHARE in many things just like your family shares in many things. Because we can LEARN and GROW from each other as we follow Christ. Talk about how older siblings can teach the younger and vice versa. Mention how your kids learn from you and you from them. Give examples of how you have learned from other Christians. Have your teens or older kids share too. Because we can PRAY for each other and share when God answers prayer. Share times that you have prayed for one another as a family and seen God at work. Because we have FRIENDSHIP and FELLOWSHIP. IF YOUR CHILDREN ENJOY WRITING, have them write a short letter to a family member or Christian friend expressing the joy they find in their friendship/fellowship. Did you know that God created you for a reason? Did you know that you have a special assignment for His Kingdom? He created you to find joy in Him but He also created you to give Him glory by fulfilling His call on your life. You don’t have to wait until you are a grown up to find God’s purpose for you! He can do great things through a person of any age! HAVE EACH OF YOUR KIDS talk about what they really like to do–what they are passionate about and remind them that God can use their talents and their skills for His Kingdom purposes. Give an example from your own life if you have one. You can experience godly joy when you are obeying God and using the gifts He has given you for His purposes. The Bible is full of scriptures that talk about the joy a person has when they obey God. Read these and talk about how God can bring joy through work and obedience. 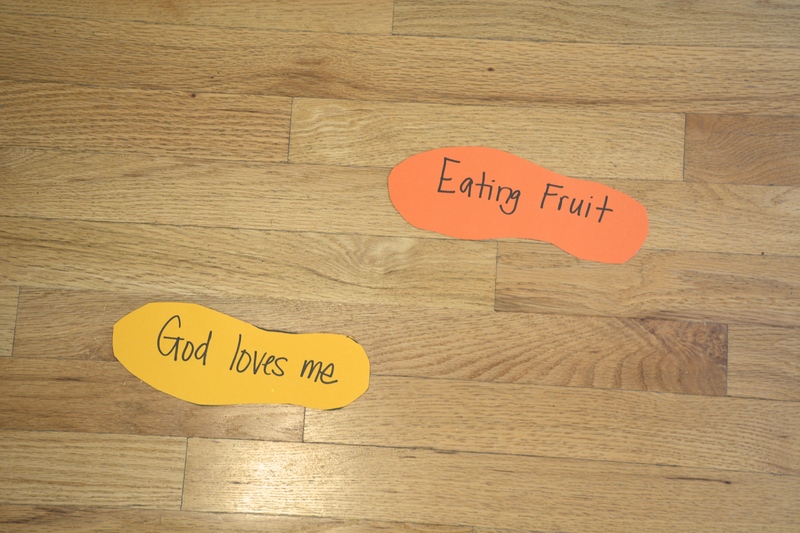 ACTIVITY: How Can God Use Me? Have your younger kids draw a picture of what they would like to do when they grow up. Older kids/teens can help the others or write about their career aspirations. Read Proverbs 15:23 and 15:30 What do these verses show us that we can do each day to bring joy to others? CHALLENGE one another to find ways to be joy to others at school, at home, and in the workplace. Tell your kids to look for ways to help bring joy into another person’s life. Maybe as a family you could all share stories later this week. “Do Christians suffer and go through hard times? THE BIBLE TALKS A WHOLE LOT ABOUT JOY WHILE SUFFERING: Divide up these verses, read them, and discuss them. Gather objects of gold, silver, and glass (or have your kids each find an object of these materials). Make sure that you can see your reflection in at least one of the items. This process repeats until the metal or glass is pure. When the refiner takes it out the last time, he knows it is ready when he can see his reflection in it. Pass around an object where each family member can see their reflection. Take the object that shows a reflection and pass it around again. SAY THIS WHILE IT IS BEING PASSED: GOD IS THE REFINER, AND WHEN WE GO THROUGH SUFFERING HE IS MAKING US MORE LIKE HIM–SO HE CAN SEE HIS REFLECTION IN US. HE PROMISES THAT HE WILL WORK ALL THINGS TOGETHER FOR GOOD. 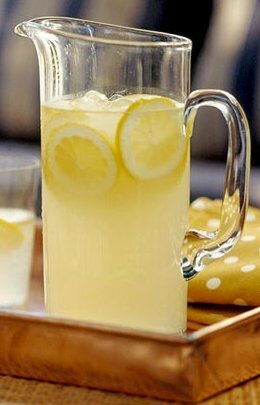 As a family, make a pitcher of homemade lemonade. Here is a good recipe if you need one. Before you start, have your kids taste a raw lemon. Yep. Don’t skip this step! Talk about how many times in life, we go through sour times. When the recipe is made drink it together. Close with Hebrews 12:2. Remember that Jesus has suffered much more than we ever will, and He endured the horrible pain and suffering of the cross because He knew there was joy on the other side! Remind your children about the joy that is ahead for believers in heaven. ” (Say child’s name), may the God of hope fill you with all joy and peace as you trust in him, so that you may overflow with hope by the power of the Holy Spirit.” Rom. 15:13. Watch the Veggie Tales Episode “Madame Blueberry”. This cartoon has a great way of teaching kids that they can be joyful without all the “stuff” they think they want. I know this week was a little more work than last week—hang in there! You are planting seeds that will produce fruit that lasts! See you next time for the fruit of PEACE. I haven’t read your blog in a while – so happy to have come across your post and be able to follow again! Blessing to you, Allen & the girls! May you be filled with the Fruits of the Spirit and Sing to each other in Praises of Him! Thanks Elizabeth! So good to hear from you!! Blessings!